Line a large baking sheet with tinfoil and set aside. Cut the cauliflower into similar sized florets and evenly place on the baking sheet. Toss the cauliflower with 2 tablespoons of olive oil and season with salt and pepper. Cut the tops off both heads of garlic so that almost all the cloves are exposed. Place each head of garlic in a little square of tinfoil and curve up the sides. Lightly drizzle the garlic heads with olive oil then season with salt and pepper. Seal up the tinfoil to make little packets of the garlic heads. Place the cauliflower and garlic packets in the oven. Let the cauliflower roast for 25 minutes then remove from the oven. Let the garlic continue to roast for another 10 minutes. While the cauliflower and garlic are roasting, heat a large pot over medium-high heat. Add two tablespoons of olive oil and the flour and whisk to combine. Continue to whisk until the mixture is light brown in color, about 5 minutes. Add the celery, onion and carrot. Stir to combine and cook until the onions have started to brown and the vegetables have started to soften. Add the salt, pepper, italian seasoning, paprika, oregano and chili powder, stirring to combine. Add the wine and water. Bring to a slow boil then cook for 5 minutes. When the heads of garlic have cooled, squeeze out the garlic cloves and add them to the soup along with the vegetable broth. Cook for 10 more minutes. Add the cauliflower and cook for 5 more minutes. Using a food processor or immersion blender puree the soup until smooth. Add the greek yogurt and puree until smooth. Taste and season with salt and pepper as desired. Heat the balsamic vinegar in a small saucepan over medium heat, stirring occasionally. Continue to heat until it has reduced to a 2-3 tablespoons. 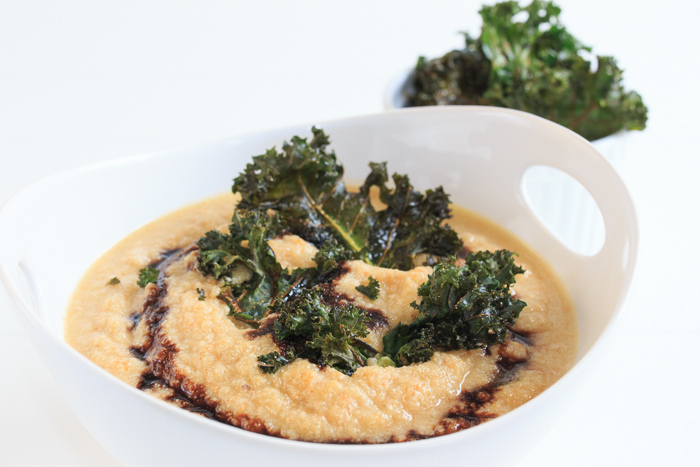 Top each bowl of soup with kale chips and a drizzle of the balsamic reduction.